"Digital is making outdoor sexier." That brief statement from Alan James, CEO of the U.K.-based Outdoor Advertising Association, best sums up how this market sector appears to be on the cusp of an explosive expansion. "It's creating added communication opportunities and is making advertisers, creatives and media planners want to look at outdoor again," said James. The digital outdoors has faced some hurdles -- price, lack of infrastructure and bandwidth constraints -- but these are being surmounted. In fact, according to Indianapolis-based WatchFire Digital Outdoor, by the end of 2007 there will be about 1,000 digital billboards in operation throughout the U.S. While this represents only a fraction of the total number of billboards nationwide, usage is expected to grow considerably. "It used to be small projects, with companies putting up a screen in their reception room to welcome guests," said Iain Campbell, sales director at True Colours Distribution, another U.K.-based organization. "The fog is lifting and it's no longer seen as a golden art. Firms are realizing that they need to get their message across and this is a platform for doing that." Digital displays advertising goods and services that can rotate frequently, so messages can be fresh and regularly updated for targeted customers. The technology is far enough along, noted Darrin Friskney, director of WatchFire, that digital billboard artwork is now similar to art created for traditional vinyl billboards, "only it's delivered via high-speed internet connection as a .jpeg file." With digital billboards, schedules are similar to those used by TV and radio stations, where advertisers change their message to coincide with a particular product/service. "This allows advertisers to present timely and relevant marketing messages that take advantage of the technology and the 'always-on' reach and frequency that is the traditional strength of outdoors," said Friskney. "In addition to managing schedules, software such as what we offer provides 24/7 monitoring and reporting of a digital billboard's performance. It also automatically controls brightness levels and provides proof-of-performance reports for operators and advertisers." Advertisers are finding these digital billboards very attractive, noted Mike Ribero, CEO of Reactrix, a Redwood City, Calif.-based interactive out-of-home advertisement and entertainment media company. "Consumers are able to interact with brands in an environment that's totally branded," Ribero said. "It combines the best of both traditional linear media and interactive, allowing groups of consumers to form a consensus around a brand. People can be part of the advertising experience in a way they can't anywhere else." One of the earliest and most successful digital outdoor campaigns was launched in Canada in June 2006 by Digital View and Pattison Outdoor Advertising for Nike Canada to kick off the World Cup. Digital signage of well-known soccer players was created and broadcast throughout popular shopping malls in Montreal, Toronto and Vancouver. Consumers were encouraged to select, via text-messaging, one of five Nike soccer videos that rotated on the screen. Text messages were routed to an SMS receiver device controlling the output of a digital signage player; the chosen video was then played in full audiovisual mode. The program was able to track the video's popularity by counting requests; consumers were reeled in by getting return messages. They were encouraged to visit a dedicated website and opt-in to receive other Nike news via SMS. The global internet media company rolled out an interactive ad campaign at Las Vegas' McCarran International Airport that ran 24/7 from July to the end of August. Large-scale projections encouraged traveler participation. The campaign featured breaking news on travel deals. In two airport concourses, projections displayed real-time travel deals offered on the company's website. 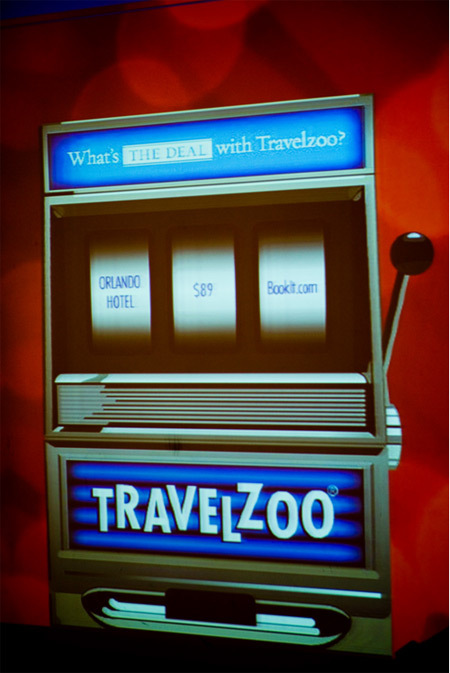 In another concourse, real-time travel deals were spun on Travelzoo slot machines when consumers engaged the 8'x 20' ad. At yet another concourse, travelers could star in their own ad -- they were projected into two huge interactive plasma screens that utilized immersion technology. 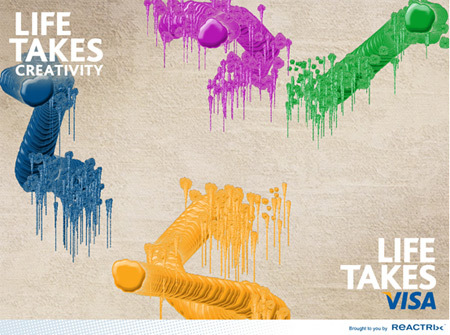 Launched by Reactrix, consumers were able to "paint" with different colored blobs of virtual paint on an interactive mat. It not only encouraged user-generated content, by a multi-user, cooperative interaction with the brand. Users ranged from casual passers-by to artists creating detailed imagery on the 6'x8' displays. Ribero said this type of interactive display allows brands to place media in locations where media has never been deployed before. "It's comparable to a digital campfire -- a larger-than-life display format allowing consumers to immerse themselves in the media and interact with brands, and each other, in a way that's similar to how they would in real life," Ribero said. "In fact, it's so intuitive, it's even clear to pets how to participate." MINI Cooper: Daktronics, a Brookings, S.D. company that both designs and manufactures digital billboards and large-screen video displays, created 5'H, 33'W interactive digital billboards posted in Chicago, Miami, New York and San Francisco this spring to help brand the MINI Cooper automobile. 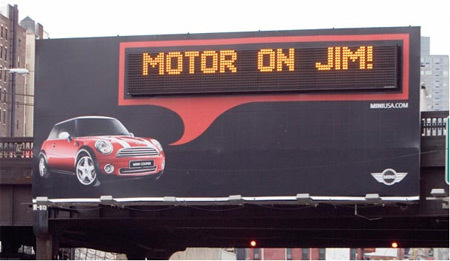 Slugged "MINI Motorby," the campaign featured personalized messages aimed at MINI Cooper owners as they drove near the billboard. According to Daktronics' California Regional Sales Manager Ed Wasserman, owners had to go online to the MINI USA website and register for the personalized messages. 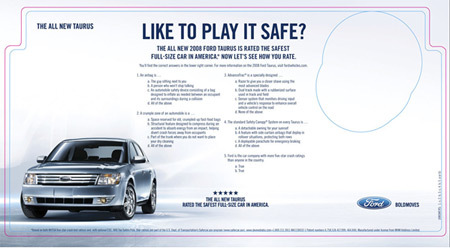 Once the owner registered, MINI USA sent a special key fob that identified the car's owner to the billboard. When the driver came within 500 feet, the key fob signaled the display, triggering the projection of the personalized message. 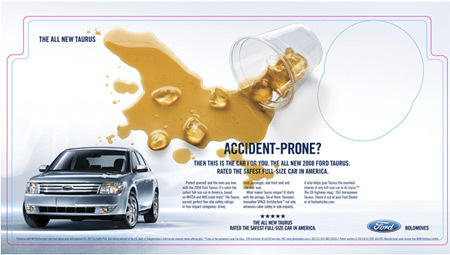 Image courtesy of Daktronics, Inc.
Ford Taurus: This car campaign offered a different twist from MINI Motorby. Tray tables on select airlines featured the Ford Taurus, including safety features and an interactive game. 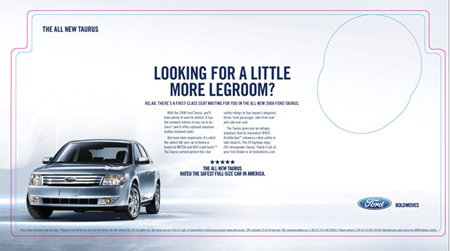 Created by Brand Connections Sky Media, a marketing and media company, three different ads were rotated among airlines, including one with a quiz for passengers. Ads (created by JWT Team Detroit) were positioned so that window, center and aisle seats each had a different ad. Interactivity is a fast emerging opportunity that digital provides. James noted that film advertisers, for instance, are booking specially constructed bus shelter sites incorporating buttons that people press to get information on a film, watch clips or check out actors' bios. "Consumers via Bluetooth and infrared can point mobile phones at specified poster sites to download video clips, music samples, podcasts or money-off vouchers for the product being advertised," Alan James, CEO of the U.K.-based Outdoor Advertising Association, said. "Increasingly, outdoor is being used as a conduit for digital messaging, extending its reach into other technologies." Meanwhile, WatchFire's 2007 digital billboard advertising forecast said that shifts in outdoor advertising will increase revenue for outdoor advertising companies. One board for many advertisers: As more digital billboards spring up across the landscape, they'll allow multiple advertisers to share the same billboard, multiplying revenue from an individual billboard by eight-fold. More sophisticated selling strategies: Exclusive category sponsorships, unlimited copy changes and automated database-driven updates will be important selling points; potential premium offerings will help advertisers maximize outdoor advertising ROI. Improved digital networks: These will eventually be on a par with radio/TV advertising. With traditional static billboards, advertisers with time-sensitive offers wouldn't consider outdoor advertising. Digital billboards will change this. Creative ad testing: Since advertisers will be able to change content/creative almost instantly, they can easily test creative techniques and adjust their billboards to get the most for their ad bucks. Advertisers will demand digital: Outdoor advertisers will eventually insist that their outdoor advertising company offer digital alternatives as they realize that the medium is one of the few remaining ad vehicles to reach the masses with no way to block or pre-empt the message. While the proverbial future looks bright, there are some potential roadblocks. Cities and counties nationwide are taking a closer look at content as more ads go digital and there may be increased regulation as local governments feel pressure from concerned constituents. Joe Marchese, president of Camarillo, Calif.-based Archetype Media, which develops next generation brand advertising platforms, wonders how ads will become part of the landscape they interrupt and whether someone will find a way to automate what's aesthetically pleasing from one community setting to the next. "Building successful business models for tomorrow's digital outdoor advertising will mean first, and last, evaluating how to improve the entire eco-system you are attempting to enter," Marchese said. "The billions will follow." But the key reason why digital will boost the outdoor market is, said James, "the sheer, naked creativity it offers. It will be totally different from outdoor in the past and will make creatives, media planners and ad agencies think quite differently about the medium. But there will not be one single way of using it -- digital is not homogenous." Author notes: Neal Leavitt is president of Fallbrook, CA-based Leavitt Communications, an international marketing communications company with affiliates in Brazil, France, Germany, Hong Kong, India, and the United Kingdom.